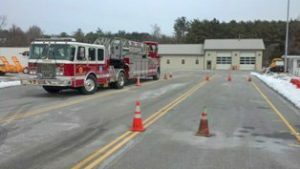 The Baltimore County Fire-Rescue Academy, in conjunction with career station personnel, conduct training and certification for personnel to drive fire apparatus. In order to drive large departmental apparatus (engines, trucks, or specialized equipment), a candidate must first hold a valid, state-issued driver's license. Candidates who do not possess the appropriate license to operate the appropriate class of apparatus may complete the Emergency Vehicle Operator process. This certification will allow a candidate to drive emergency apparatus only in the class(es) specified. Fire Apparatus Driver/Operator Jason Wurzbacher coordinates the Academy's Driving Program. Operators need either a Class "A" or Class "B" Maryland Driver's License or an EVO Card issued by the Baltimore County Fire Department. A Class "A" license will permit the operator to drive all departmental apparatus. A Class "B" license will permit the operator to drive most units, but not ladder trucks or USAR 17. Operators with a valid out-of-state Class "A" or Class "B" license do not need any other license to drive that class of vehicle for the Baltimore County Fire Department. They will need to complete the EVO Testing Process and be issued an EVO Card by the Baltimore County Fire Department if they will be operating an apparatus of a different class than their license permits. Please see the Apparatus Information and Bulletins section for more information.